Sculpture in wood of Our Lady of Bavaria. The Virgin Mary is depicted with holding her Child Jesus. The wood is finely decorated with inlaid, portrayed the veil of the Madonna as moved by the wind of heaven. 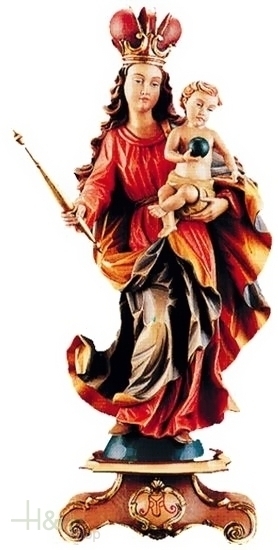 The Madonna holds a golden scepter, and the Child Jesus a ball, respectively the symbols of the power of God and understanding of the universe.